Walking down the driveway to the guest house with an armload of paper towels, etc., I saw a stranger trudging up from the county road. Unlike the two Jehovah's Witnesses who showed up yesterday--and they drove--he carried no well-worn Bible but binoculars and a camera mounting a huge, camouflage-patterned telephoto lens--obviously a Serious Wildlife Photographer. Sunburned, with a north-of-England accent. It turned out to be birding writer Richard Crossley, needing photos of band-tailed pigeons for a new book. And he had been told that this was the area to visit--and then a neighbor had told him that we were the bird experts, which we aren't really, unless doing Project Feeder Watch contributes some degree of expertise. 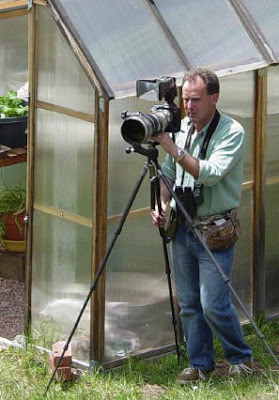 RIGHT: Momentarily frustrated in his quest for band-tailed pigeons, author and wildlife photographer Richard Crossley contents himself with shooting feeder birds. M. and I fell instantly into hunting-guide mode, saying what guides so often say: "Well, they were here yesterday, bunches of them. They ought to be around." We sent him up an overgrown old road in one direction. No pigeons. Then M. spotted one on a telephone wire, but by the time Crossley had circled around toward it (to get the right angle of sunlight) it had flown. "Maybe late afternoon would be better," we suggested. Crossley contented himself with shooting photos of the feeder birds: black-headed grosbeaks, pine siskins, Cassin's finches. A native woman, trailed by a pack of large and unkempt dogs, called from further down the forest path. "There," she said in her musical tongue. "Pigeons! That tree!" Half a dozen band-tailed pigeons sat at the top of a dead ponderosa pine. 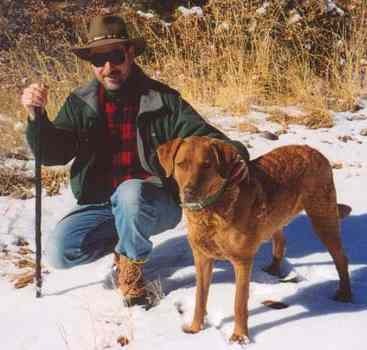 Crossley grabbed his tripod and began moving uphill toward them, pausing, shooting, stalking. And I hope that he got what he needed for his project. Way to go "native woman!" My own best beloved has her own name for pigeons. She calls them "rats with wings." These band-tailed pigeons are native birds in Colorado, but you don't see them as far north as Denver, as I understand. City pigeons (rock doves) are actually fairly interesting birds.